I am the longest-running employee at LiveWell Colorado, so I have been around to witness many transitions in the LiveWell@School Food Initiative program model since its launch in 2010. Today, the School Food Initiative (SFI) provides comprehensive training in culinary arts, marketing, and operations to effectively implement a sustainable scratch-cooking model in school kitchens. Only recently have I become more hands-on with the SFI program. My role is to help food service teams sustain the work begun in their cafeterias by gaining support through broader school wellness initiatives. This could mean addressing inconsistent messaging about the importance of healthy food in school environments—as we often see in classroom celebrations, rewards, and fundraisers—or championing school wellness efforts by leading the reconvening of a dormant district wellness committee. While I’ve spoken for years about the great work being done by the SFI Chefs and others working on this project, I struggled to specifically identify how this work happens – how school kitchens make scratch cooking truly work in a sustainable, cost-effective way. 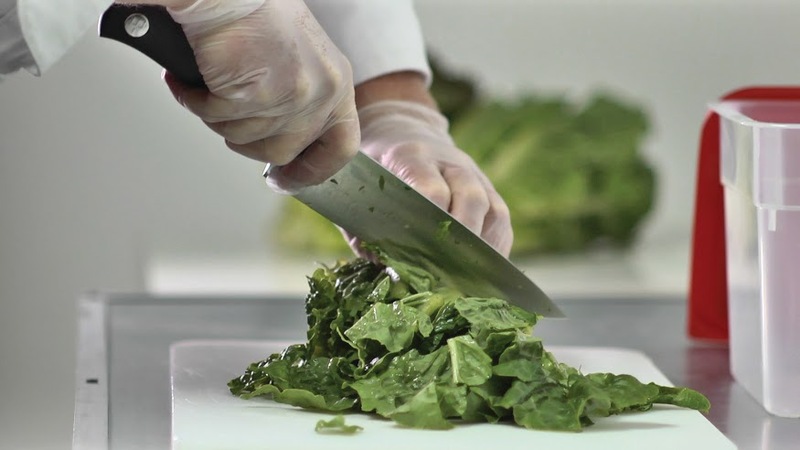 Recently, through a partnership with LiveWell Garfield County, SFI coordinated three regional trainings that focused on food safety, knife skills, recipe conversion, and student engagement for Roaring Fork, Garfield D-16 and Garfield RE-2 school districts. I had the pleasure of watching Chef Chris and Chef Jessica entertain and educate kitchen staff from Garfield RE-2 school district—and picked up a few new knife skills of my own too. What was clearly communicated over the course of this day-long training is that while there are perceptions that scratch cooking is too expensive, it is actually quite achievable if districts pay close attention to kitchen efficiencies and food waste. I used to frequently toss around the term “kitchen efficiencies” before I attended this training. Now I understand that it means knowing time-saving ways to cut fresh produce, and setting up a station so that movement flows naturally and smoothly. There was an array of beautiful fresh food placed out on the serving table for lunch, and thankfully, I got to partake in the delicious and nutritious meal. The colors on the table—vibrant green and orange from the broccoli and carrots that were quickly blanched before roasting—the aroma from the baked chicken with a spice rub, and the fruit tray with kiwis sliced in quarters, all created a feast for the eyes as well as the belly. I walked out of the cafeteria that afternoon satisfied not only from the delicious meal but also confident knowing that the LiveWell@School Food Initiative can take Colorado school meals beyond the standards required by the USDA to the quality that we see at many fine restaurants across our great state.